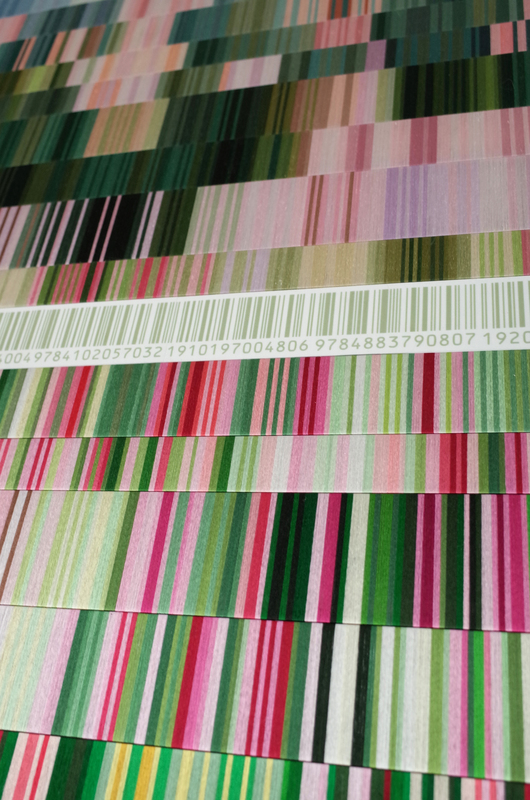 Bar code part represents something artificial and men themselves, multi colour stripe parts represent the world around us. If you see the detail of the colour part, mismatched colours like normally people won’t combine together are located next to each other. This world is filled with a wide variety of people and miscellaneous things, at first glance, it looks chaotic but when you see it from far away, you’ll find out unexpected harmonies. The world surround us also seems to be chaotic, but in fact, there are some kind of balance and harmony. If you see the world from a distance, you can find new beauty and harmony. Like this, I represent the relation of the world surrounding us and ordinally life of people by my artworks. ※Coil embroidery threads to thin cutted acrylic boards. Stick them to an acrylic board. ※An animation which express the concept above.